Shaun Scott, staff photo Mercer Island midfielder Sam Lee scored two goals against the Interlake Saints in a rivalry showdown between KingCo 3A powerhouses. 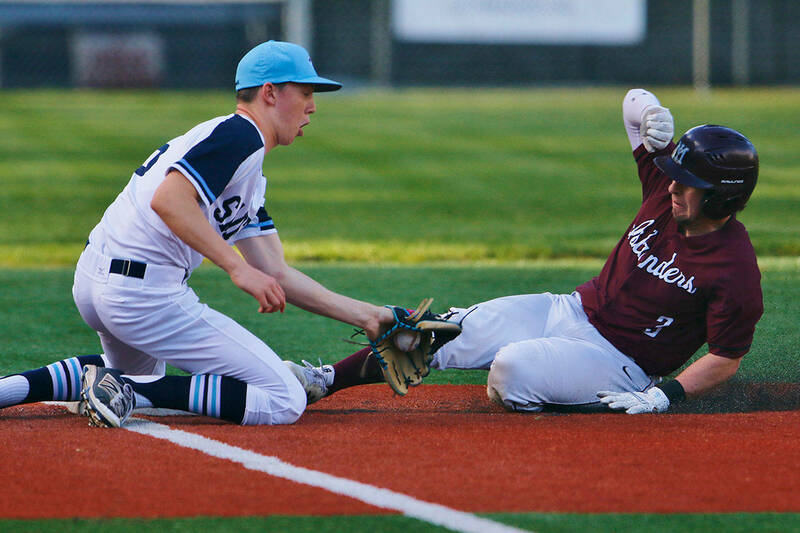 The Islanders defeated the Saints 4-2 on March 21 at Interlake High School in Bellevue. The Mercer Island Islanders boys soccer team waited nearly 10 months for another opportunity to face the Interlake Saints. Interlake, who captured a 1-0 victory against Mercer Island in the Class 3A state championship game in May 2016, is aiming to win their third consecutive state championship this season. The Islanders were clicking on all cylinders against the defending champs en route to a convincing 4-2 victory against the Saints on March 21 at Interlake High School in Bellevue. Mercer Island improved their overall record to 3-1 with the win while Interlake dropped to 2-1-1. Mercer Island midfielder Sam Lee, who scored a team-high two goals against Interlake, said his team was intensely focused for the showdown. The Islanders had a commanding 4-1 lead at halftime. Lee scored the goal of the night in the 10th minute of play. Lee’s laser beam line drive shot from 35 yards out found the back of the net, giving the Islanders a 2-0 lead early in the first half. Mercer Island midfielder Jack Delay scored the first goal of the game in the second minute. Mercer Island defender Reis Kissel scored in the 32nd minute, giving Mercer Island a 3-1 lead at that juncture of the game. Mercer Island head coach Colin Rigby wasn’t surprised to see his team amped for the matchup against a squad that denied them a state title 10 months ago. The Saints cut the Islanders lead to 2-1 after senior Noah Parsons found the back of the net in 12th minute of play. The Saints scored again in the 47th minute, slicing Mercer Island’s lead to 4-2 but wouldn’t get any closer for the remainder of the game. Interlake head coach Dan Peterson said his team made too many mishaps against a team of Mercer Island’s caliber.